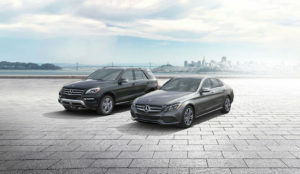 Get a High-Quality Vehicle with the Mercedes-Benz CPO program! What if you could enjoy the top engineering and beauty of a luxury car without breaking the bank? If this sounds too good to be true, then you owe it to yourself to check out the Mercedes-Benz CPO program through the Sullivan-Parkhill Auto Group. Drivers can enjoy a Certified Pre-Owned vehicle at an affordable price. Not only do you get to own one of the finest vehicles in the industry, but you’ll also receive a bundle of exclusive benefits like extended warranties and certifications! Mechanics start with an 11-point General Inspection to verify mileage and history. The engine undergoes two separate tests, a 13-point Pre-Road Test and a 16-point System Check, to ensure proper functioning. The 32-point Electrical System Inspection is a thorough look into everything within the vehicle that takes a charge: fuses, radio, sunshade, and more. A 14-point Road Test assesses the vehicle’s handling and performance from the driver’s seat, and the 3-point Post-Road Test Inspection checks for anything unexpected after the drive is over. In addition to the mechanical tests, technicians also do a 32-point Appearance Inspection. You can feel confident that your Mercedes-Benz will shine like new. When you drive off the lot in your Mercedes-Benz CPO vehicle, you’ll also enjoy a generous warranty package. After the original 4-year New Vehicle Limited Warranty ends, your Extended Limited Warranty covers one extra year with unlimited miles. That means your powertrain, steering, brakes, suspension, climate control system, and much more are under warranty! You can also opt for the Mercedes-Benz Prepaid Maintenance program, which provides access to certified Mercedes-Benz trained technicians who only use genuine parts. The 24/7 Personal Assistance service offers everything from jump-starts to flat-tire fixes with just a phone call. Trip Interruption Coverage reimburses drivers for covered expenses up to $300 per day. CPO vehicles enjoy dealer support across the United States, so you are welcomed at any dealership across the nation. The Vehicle Exchange Privilege allows you one week or 500 miles to exchange the vehicle if you are unsatisfied. Ready for a Little Luxury? The Mercedes-Benz CPO program is an incredible deal for savvy drivers, so don’t hesitate to visit the Sullivan-Parkhill Auto Group for more information! Contact us online for more information!